In 1957, the U.S. Navy began to plan a new concept for airborne fleet defense. A large subsonic interceptor with a powerful radar was to be equipped with very long range high speed air-to-air missiles to shoot down approaching Soviet strike aircrafts and bombers. In 1958, Bendix and Grumman were selected as contractors for the AAM-N-10 Eagle missile. 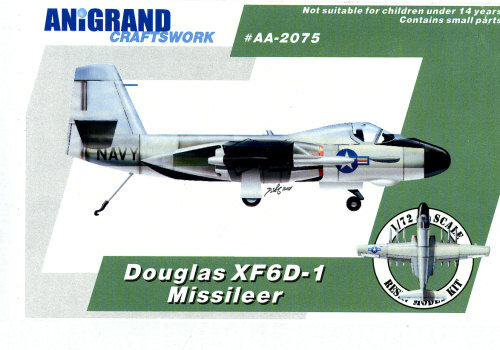 A year later the Douglas XF6D-1 Missileer design was chosen for the launch platform with an order for two prototypes. The most important feature of the XF6D-1 was its Westinghouse AN/APQ-81 pulse-doppler radar, the first track-while-scan radar developed for a fighter aircraft. In 1960, the Navy development organizations became convinced that the XF6D-1 was too expensive, and changed in favor of exploring the feasibility of using the F-111B. The Eagle missile program faltered as well. The XF6D-1 and Eagle missiles were both put on hold in December of 1960, before any XAAM-N-10 prototypes could be tested. However, the idea of a long-range fleet-defense interceptor was realized later with the F-14 Tomcat and the AAM-N-11/AIM-54 Phoenix missile. Boxed in a sturdy cardboard container, one sees the usual segmented polybag with the parts in various sections to help keep them from being damaged during shipment. It worked well on this one as I found no problems with damaged parts. You get engraved detailing, a minimalist cockpit, wheel well detailing that is believable, and a few mold faults such as pin holes on the edges of a few parts. Now this kit looks a lot cleaner in that regard from previous releases. In reality, none of these are really of much concern to the person who likes to build kits like this. The worst faults are air pockets on wing/stab tips and the very tail end of the fuselage. I've had much success inserting styrene rod and sanding to shape, followed by a light application of filler or surfacer. 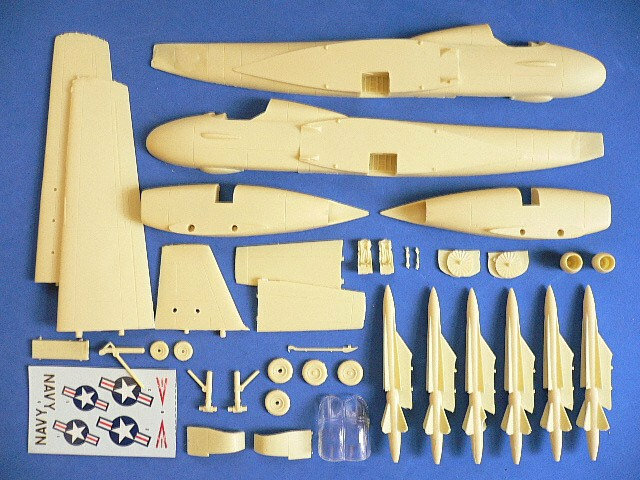 The photo of the kit parts is one I cribbed from the Anigrand web site and shows pristine and clean parts. Yours will have sprue stubs and a bit of flash/air pockets. The kits from the last few years are uniformly well engineered in terms of having alignment pegs and holes for various bits, and when one is molded with a four piece fuselage, as is this one, the tabs/holes are well done and after the usual cleanup, will produce a join that is just about invisible to the uninitiated. All of the flight surfaces are a single casting so no worries about cementing an upper and lower half together. The missiles are molded onto the pylons and these missiles have a few air holes in a few of the fins. You basically paint the whole assembly white and plug them into the holes in the wings. Those wanting to be a bit more realistic will want to incorporate some drop tanks from the spares bin on the inner wing station as these planes would have been quite fuel thirsty. Something that Anigrand is doing more and more is including a clear resin canopy. This is great as it has well defined frame lines (to help with masking), something their vac bits did not have. The resin is fairly clear and a treatment with Future will undoubtedly make it even clearer. So here we have another great prototype/paper project aircraft from Anigrand. While this one never went past the paper stage, it would have been an interesting addition to the Douglas line-up and it certainly shows its heritage back to the Skyknight. My thanks to AnigrandUSA/Nostalgic Plastic for the review kit. Get yours today and pay no US shipping.